On August 26, 2011, NCDPI released the Understanding the Standards module. This module provides an overview of the new standards, instructional support tools, and timeline. After a brief overview, content-area teachers can complete specific module sections on the subject areas of their choice. These content-specific sections provide clear examples of the major differences in the standards as well as the difference in student expectations. Understanding the Standards lends itself to a blended approach of professional development. The module provides interactive activities and questions best explored in small groups. Access Understanding the Standards by using your NC Registration ID at https://center.ncsu.edu/nc. 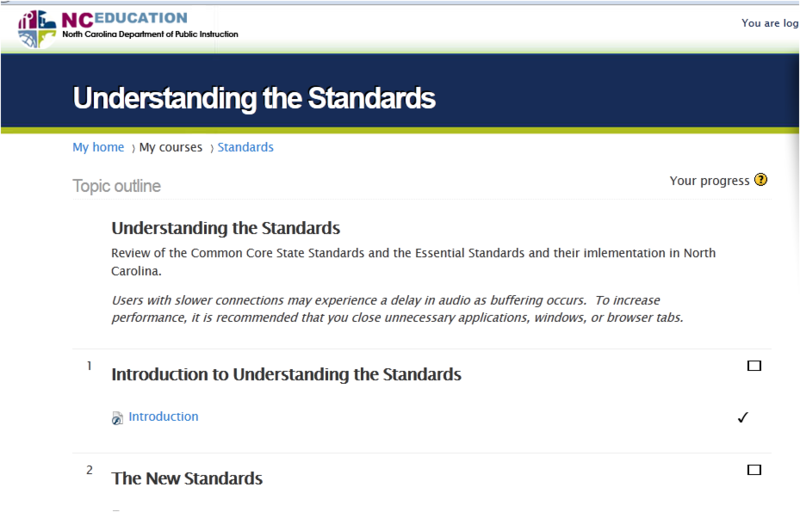 Click “New Standards” and “Understanding the Standards.” This module will help you get started in your journey to understand and implement the new Common Core State Standards and North Carolina Essential Standards.